The Ecology Center created Michigan's first recycling drop-off station at Ann Arbor's Arborland shopping center in 1970. 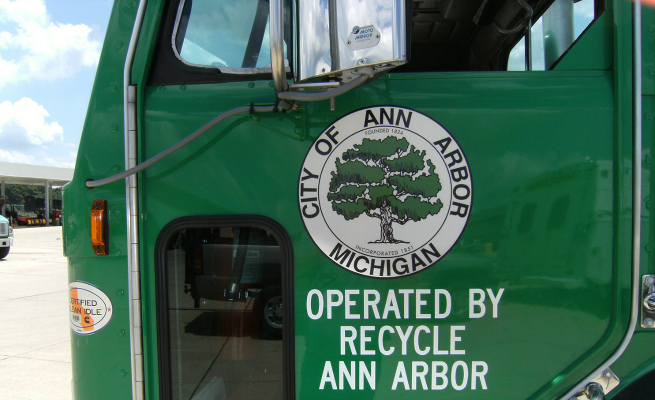 Seven years later, community activists started Michigan's first curbside recycling program called Recycle Ann Arbor. Soon after, the curbside program and Recycle Ann Arbor were brought under the Ecology Center's umbrella, and over time, they grew into a nationally recognized leader in commercial and residential recycling, dedicated to providing education and innovative services in the collection, processing, and distribution of recycling materials. Today, Recycle Ann Arbor is organized as a wholly owned nonprofit subsidiary of the Ecology Center. It operates Michigan's largest community Drop-Off Station, the ReUse Center, the Ann Arbor curbside-recycling program, and the Recovery Yard, the state's only nonprofit construction recycling program. In the 1970s and 1980s, community-based recyclers were the only providers of municipal recycling services, and hundreds were founded to follow the lead of the Ecology Center, Recycle Ann Arbor, and other recycling pioneers. Today, Fortune 500 landfill companies provide basic recycling services throughout the United States in response to public demand, but their lobbyists disparage recycling, and their business models actively discourage it. In 2015, Recycle Ann Arbor and three other large nonprofit recyclers constitute what's left of the community-based recycling movement in the United States. Allied with for-profit recycling processors and progressive policy makers, they're among the country's leading voices for zero waste and strong recycling programs. Joining the organization in 2012, RAA is now led by CEO Kirk Lignell, who brings an engineer’s perspective to the role.